What started life as the Famicom (Family Computer) in Japan went on to become the machine that saved the videogame industry. After a major games slump in the west, The Nintendo Entertainment System defied pundits and sold in millions. Gamers scrambled to see and play classics like Super Mario Bros., The Legend of Zelda and Excitebike, all of which were leaps and bounds ahead of other home systems' games. The system that took the world by storm boasts a game library that proves the Nintendo difference can still shine through after over 20 years. Gaze up at the Nintendo Entertainment System's towering pile of over 500 titles, and you'll spot classics like the original The Legend of Zelda and the divine Super Mario Bros. - the Shigeru Miyamoto-developed side-scrolling platformer that arguably started it all. A horizontal slab of plastic that rests in your palms. A cross-shaped directional control pad. Two small round buttons for your thumb. Twin 'Start' and 'Select' buttons. The basics of the NES controller became an industry standard that still resonates today. 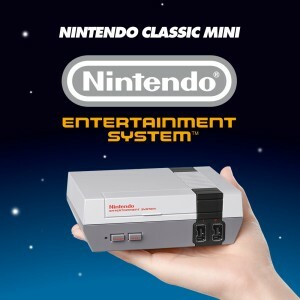 Bring back memories and make brand new ones with the Nintendo Classic Mini: Nintendo Entertainment System!